The Ministry of Land, Infrastructure and Transport on Tuesday admitted that the reduction of the maximum working week in July could cause a shortage of public bus drivers. The ministry sent a letter to public bus operators asking them to come up with solutions and told them to adjust operating hours or consider merging or scrapping routes. 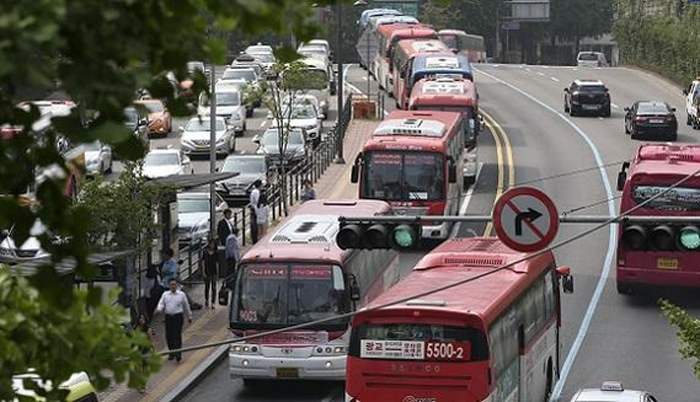 A ministry official said Tuesday, "As working hours decrease, more bus drivers will be required, but it's not easy for bus operators to boost the number of drivers at short notice." He said in the short term it may be necessary to reduce routes or decrease the hours of operation. The ministry predicts a shortage of 13,000 bus drivers in July and another 24,700 in July next year. Public bus operators have been allowed to make their own flexible working arrangements with drivers, but from July drivers can work no more than 68 hours a week, and from July next year no more than 52 hours.